Rayyan, a 23-year-old enthusiastic college going student, is not very happy with the work that has been done so far by the state and central government in his hometown, Rampur. “There are no factories, no good colleges and we don’t see any of the development we grew up hearing about. We want to stay here forever but the need for livelihood forces us to leave this town.” Unfortunately, in this city, once inhabited by the royals, most of the youth think the same way. Rampur is a small city in the state of Uttar Pradesh, situated around 314 KM away from the state capital, Lucknow. It has a royal and splendorous past. Nawab Faizullah Khan was the first ruler of Rampur, whose name is still discussed by its residents. The rule of the Nawabs came to an end after India secured its independence and the new Home Minister, Sardar Vallabhbhai Patel, asked all the states to surrender their crown and merge into the Republic of India. Rampur has a remarkable history and some of its past glory could be gauged by the historical buildings that still stand as a testament to its past. A great historical treasure, Raza Library, was constructed by Rampur’s royals at the heart of the city, which is a reminder of the kingdom’s glorious days of championing the causes of learning. The library is a unique centre for the preservation of historical manuscripts written in Urdu, Hindi, Pashto, and Sanskrit. It also contains the first translated copy of the Quran into Pashto. This perfect sanctuary of knowledge and learning was an outcome of the efforts made by Rampur’s first Nawab, Faizullah Khan. Ravish Kumar, the well-regarded journalist from NDTV, visited the library a couple of months ago and depicted the uniqueness of the library’s minarets. The library’s minarets seemed to convey a massage of religious harmony, as it represents four major religions in India: the first part of the minaret at the bottom is built in the shape of a Mosque, the part just above this resembles a Church, the third part reflects the architectural design of a Sikh Gurudwara and the top most part of the minaret is built in the shape of a Hindu temple. 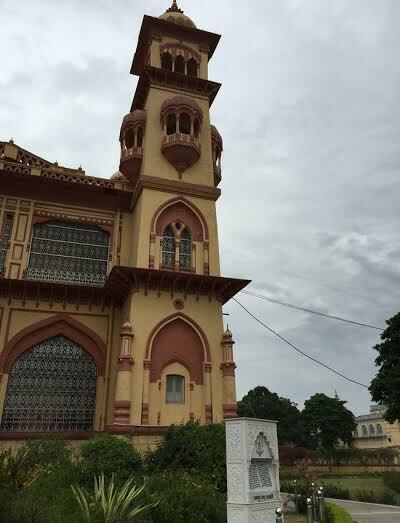 Kumar referred to the library’s minaret as a perfect example of India’s inclusive culture, which couldn’t have been constructed without the assent of the Nawab. It remains a mystery why this unique architectural wonder didn’t attract a wider attention so far. Was it because it was constructed by a Muslim ruler? Apart from the library, the city is full of other historical buildings such as Jama Masjid and Gandhi Samadhi, which often attract a lot of tourists. Rampur is also well known for its special knife, known as the ‘Rampuri Chaku’, which made its appearance in Bollywood movies during the 70s and 80s. The making of the knife provided livelihood to scores of people, until the government of India decreed that the blade of the knife couldn’t be longer than 40 inches. This deprived a number of artisans their daily income. Maulana Azad was the first MP from Rampur, who also became the first education minister of independent India. Since then Rampur has been a hub of key leaders in Uttar Pradesh politics as well as the center. Currently, Azam Khan, the most powerful leader in Uttar Pradesh after Chief Minister Akhilesh Yadav, hails from Rampur. A major Muslim face in the BJP, Mukhtar Abbas Naqvi, also shares a very deep connection with the city. Besides these two powerful faces of Indian politics, the widow of Nawab Syed Zulfiqar Ali Khan, Begum Noorbano and her son, Nawab Kazim Ali Khan, who is also a Member of the State Legislative Assembly, have strong political connections with Rampur. Despite being a city of many powerful leaders in Indian politics, Rampur has remained stagnated as jobs for the youth have dried up because of lack of industries. Many of the city residents attribute this to their bad luck. “When a neighboring state, which is approximately 60 kms away, can attract plenty of industries, why can’t our city do the same?” asked a women, who refused to disclose her name. Even the neighboring cities such as Moradabad and Bareilly, which are also part of UP, have made considerable progress in the past few years, Rampur has failed to attract investors. Rampur scores very low on the literacy index and one-fourth of Rampur’s population live below the poverty line. In many cases, students withdraw from their study due to their elders’ pressure to earn as early as possible. After leaving study, students have a very few alternatives. Either they join a tailoring shop or carpentry, where they earn a meager amount of money while doing apprenticeship. Besides this, they also look for other work where they can earn a quick buck. In most cases, they learn handicraft, which can be mastered within two or three months, unlike other similar works, which demand more time and hard work.